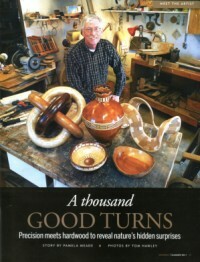 Welcome to my woodturning web pages. The photo gallery shows a few of the pieces I have made, including information about what inspires me to make them. My pieces have been shown at Two Sisters Gallery (formerly The Monroe Street Art Gallery) in Monroe, MI; the River Raisin Gallery in Tecumseh, MI; and the Bedford Community Arts Council show where I have won several awards. My work has been featured in Monroe Magazine, and was displayed at their 2012 Artist Showcase. I hope you enjoy viewing my turnings as much as I enjoyed making them! If you would like to purchase one of my turnings please contact me.